That’s the claim, but hydrogen still needs an energy source for its manufacture, so any sustainability depends on what that source is. And looking a bit closer, the report says: “If the extracted hydrogen gas is ultimately used as fuel, for example in a fuel cell of a car, the hydrogen reacts back to water with oxygen gas from the atmosphere.” So what happens when a hydrogen powered fuel cell vehicle trails water from its ‘exhaust’ on to a road in sub-zero temperatures? An icy, or more icy, surface seems likely to be the undesirable result. The research group led by Leiden chemist Marc Koper has discovered a catalyst that minimizes the production of chlorine gas during salt water electrolysis, reports Phys.org. The invention can enable the direct production of hydrogen from seawater. The article has been published in the Journal of the American Chemical Society. “In the electrolysis of salt water, such as seawater, the ultimate goal is to produce hydrogen at the cathode,” explains Ph.D. student Jan Vos from the Leiden Institute of Chemistry. “The product formed at the anode is ideally oxygen, because that is harmless to the environment.” However, during salt water electrolysis toxic chlorine gas can also form at the anode. The electrolysis of water is an important step for the production and use of hydrogen as an alternative energy carrier. An anode that counteracts the formation of chlorine gas enables water electrolysis where it is not necessary to first rid the water of dissolved salt, the process of which still costs significant amounts of energy and capital. It would allow the direct production of hydrogen from seawater, thereby relieving the rare freshwater reserves on earth. Er, it only becomes sustainable if you have an unlimited energy source in which case this is totally unnecessary. The whole article reads like over hyped spiel from a marketing wonk or a very immature green trying to attract the attention of the church of climatology. The only thing here that might be of any value is the catalyst for blocking selected gas production – always assuming it will scale up from the lab experiment to economic industrial production. Rather than dumping the exhaust water on the road, it gets recycled as irrigation. Full cooperation from farmers. I note that the article says nothing about the efficiency of the electrolysis using this method. And nothing about the many desalination plants that simply use osmotic filters to turn seawater into potable water. Does the researcher not know about real-world stuff? Does the reseacher know..? NO. The next step is probably to use wind turbine generation for electrolysis, which would be about 35% efficient when the wind is blowing. Send lots of subsidies. In the 60’s, on submarines, we used this to produce oxygen, the H2(g) was pumped over the side. All that is needed is nuclear power. The greens are idiots, the only thing that will make battery powered cars and reliable power is nuclear power. “Most American subs are nuclear powered. Therefore, they have enough electricity to last underwater for months on end, without ever refueling. I believe 1 Gram of enriched uranium produces as much electricity as 100 tons of coal (Needs verification). 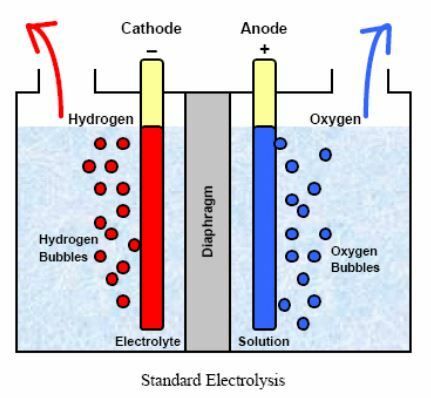 Through a process called electrolysis, in which an electrical current is applied to a sample of water, the Hydrogen and Oxygen atoms react in a decomposition reaction. Researchers in Norway report that the carbon efficiency of a conventional Biomass-to-Liquid (BtL) process can be increased from 38 to more than 90% by adding hydrogen from renewable energy sources. The increased carbon efficiency is possible because the water gas shift reaction is avoided and instead a reversed water gas shift is introduced to convert CO2 to CO. This means that the amount of fuel can be increased by a factor of 2.4 with the same amount of biomass. In addition, the emitted amount of CO2 per produced unit can be reduced by a factor of 16. Usual questions: with exactly what energy source is the hydrogen being produced, and at what cost? ‘Renewable sources’ is a bit vague. Probably hydro in Norway. has anyone done the least research on the effects on the public when tens of thousands of cars, trucks, and buses ‘burn’ hydrogen in a packed urban area? It takes oxygen out of the air. That means lower available oxygen in the atmosphere at low levels where we live and breathe. What could possibly go wrong? You have to wonder about people who think it makes sense to use electrolysis to generate hydrogen in massive quantities. There are much better ways to convert water into hydrogen and oxygen. Think thermal dissociation using high temperature MSRs (Molten Salt Reactors). Parker solar probe nears launch: Heavy lifting imminent.